The back. Acting with the back. Drawing our emotional focus into a scene with the silent power of an arched shoulder or a slumped posture or an outstretched arm or an alert stance marching into the unknown. I shall continue in subsequent posts to address other themes that emerged for me in my cinematic Garland immersion at the Walter Reade. Today’s musings focus in part on two of the four films that entertained us the final day of the festival — I Could Go On Singing and A Star is Born. I add Judgment at Nuremberg into the mix despite the fact I’ve already mused on that fine film in a prior post.Today’s visual theme: the power of the universe in a tiny upper back. In each of today’s films Garland makes her entrance, in character, with the camera filming her from the back. And some of her best scenes in these films are again — from the back. A reflection. I wrote a rhapsodic post in May 2010 about my experience attending the East Coast premiere showing of the visually restored version of the film that was released on DVD in June 2010. There I was wowed by the crisp lines, the reds, the colors. All those details remain vibrant and iridescent on the big screen and are worth a mention — yet today I will focus upon camera placement and stance and power in the back.Our plot: Esther Blodgett (Judy Garland) a 30-year-old band singer who has a powerhouse voice and persona meets Norman Maine (James Mason) the movie star on his way down who gives her a vision of her future, assists her entry into his home studio, and can’t stave off his own self-destructive demons. Esther enters working as a singer with a band, preparing backstage prior to a benefit performance. We haven’t even heard her sing yet (“You Gotta Have Me Go With You” will follow in just minutes), but we can’t keep our eyes off of her. Back stage at the Shrine Auditorium with band pianist Danny McGuire (Tom Noonan) and Esther Blodget pre-Vicki Lester name change, smoothing her nylons. This Garland entrance comes over 8 minutes into the movie. Later that evening, at the Downbeat Club where Esther sings for herself and the boys in the band, Esther plays with the ballad “The Man That God Away” not knowing that Norman Maine has found her there and is sitting, watching and listening, in the shadows. Here again Esther makes points with her back, mid tune. Esther and the boys in the band pause for breath in “The Man That Got Away”. There are successes and failures and day-long drunks and drying out. And finally, devastatingly, Norman ends his own life and leaves Esther to endure. The penultimate sequence of the film involves Esther and home and the efforts of her old pal accompanist Danny to cajole her into attending this year’s Shrine benefit (providing a tidy cyclical button on the plot construction). Danny comes to Esther/Vicki’s Malibu beach house, where she is sitting by the fire, solemnly mourning Norman’s passing a few weeks before. Esther/Vicki by the fire, not planning on attending the Shrine benefit. Esther demands to do things in her own time, but Danny convinces her to attend as a testament to Norman’s faith in her and her career. And Garland responds with great command with her back. Esther at the beginning of Danny’s final speech. Esther at the end of Danny’s final speech. I wrote about this movie a week or so ago in a dual posting on war, addressing this movie and World War Two along with For Me and My Gal set in World War One. Garland in Judgment at Nuremberg portrays a real person, Irene Hoffman, who was victim of the Nuremberg laws legislating the nature of interpersonal relationships between Aryans and Jews. Pared to her non-singing acting essence, we have Garland in three scenes: when American prosecutor Colonel Lawson (Richard Widmark) comes to her Berlin apartment to solicit her testimony on this painful experience of many years before, and two courtroom scenes. Ninety minutes into a three-hour movie we meet Garland, in shadow and from the back, and she doesn’t speak for a few minutes into this initial scene. Yes Irene agrees to travel to Nuremberg to testify, emotionally responding to the American Colonel’s invocation of the memory of her dear Jewish friend who was put to death for their purported relationship. Even without the devastating courtroom scenes to come during which Irene is forced to relive the emotional details of the pain of past events, this initial decision-making scene is permanently etched in memory. Irene Hoffman Wallner listens silently in the shadows. Garland’s entrance 90 minutes into the film. 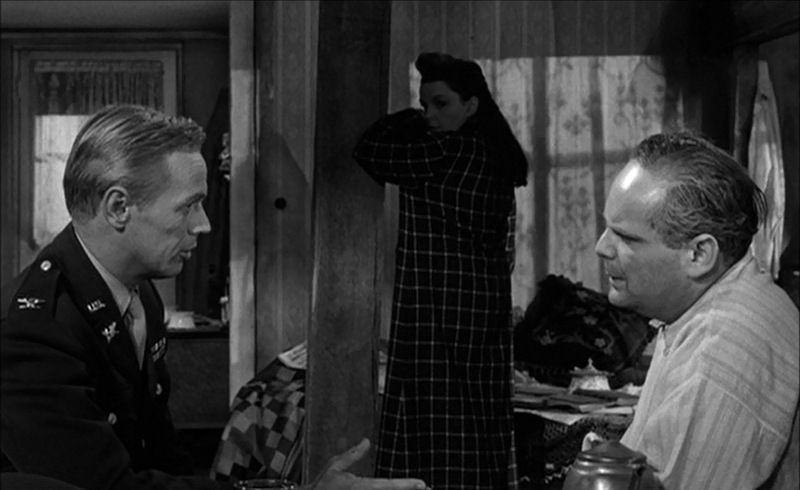 Colonel Ted Lawson (Richard Widmark) and Hugo Wallner (Howard Caine) debate the merits of Irene’s testimony. In what was to be Garland’s final completed film, she makes another entrance with the camera at her back. 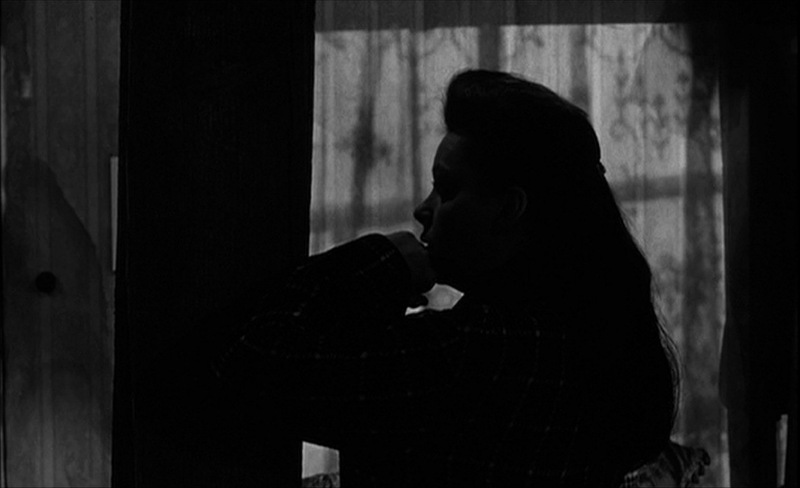 Note that throughout this movie there are scenes in which her silhouette is etched in doorways or framed by windows to highlight some emotional reality for the character. It is a dimly lit and shadowy tale of limelight and spotlights and off stage realities of paths not taken and embracing one’s destiny. Jenny Bowman (Judy Garland), American singer in early middle age is performing in London and contrives a visit to her old flame David Donne (Dirk Bogarde) for a throat examination. Neither has seen the other for years. We soon discover that they have an adolescent child in common, suspect that David has reared the child with his recently deceased wife, and see that headstrong Jenny desires to see the young man. Jenny and David do visit the boy Matt (Gregory Phillips) at his boarding school in Canterbury, a school vacation leads Matt visiting with Jenny in her London Savoy suite and attending performances at the Palladium, and Jenny’s dreams grow of bringing Matt into her life. She doesn’t intend on stealing him away from David so much as taking both of them on — she is trolling for connection with both men. All agree by the end of the movie to keep things at status quo and we leave Jenny on stage receiving rapturous applause. Jenny’s entrance at the top of the movie, making a visit to throat doctor David. Jenny, post examination, cajoles a drink for old time’s sake out of David. While re-applying her lipstick in the mantel mirror, she spies David place a framed photograph face down on the table by the liquor that we as an audience understand immediately to be the child in question. There are secrets in the shadows, and lurking past hurts. A quick glance, both back and face and subtle reactions. Jenny spies with her little eye David trying “to hide him”. The ex-lovers joke about numbers of husbands for Jenny. And Jenny delivers, back to David, one of my favorite lines of the movie. David and Jenny engage in one of their many pas de deux during the movie. This engagement is more humor than vitriol but still edgy. A final image here when Jenny says good-bye to Matt after their several days together, and angry words with David, and just before she goes on stage to sing “By Myself.” In her Savoy suite, contemplating life “solo, all alone, by myself, from now on.” Note the shot is carefully composed to include Jenny’s companion and assistant Ida (Aline MacMahon) so that we know in reality she is not all alone, yet her emotional point is resonant. Jenny contemplates the future and Ida contemplates Jenny. The power of the back in an Edith Head suit. Golly.